Of course, I wouldn't want to do it alone. Because, you see, there's no reason to. One of the amazing things our teachers told us is that the natural building community is huge, generous, and generally awesome. Stay in touch, we were told, and when the time comes to build your project, let us know - because there are tons of folks who will want to come and work on it with you. Because natural builders are like that. I grew up in urban sprawl and I don't have much sense of community, but here's a group of people who are passionate, creative, and dedicated to helping each other. I don't know if I would have personally connected with the people who came to the workshop individually if I'd met them at, say, a party - but as a group, they were kind, hard-working, mutually supportive, and totally delightful to be around, and together we built something absolutely lovely. If that's not community, I don't know what is. above. Image via Sundog School of Natural Building. But it's not just that. Turns out? Building with cob is easy. I mean, I really did learn in nine days enough to go off and make something essentially equivalent to the building I just worked on. There's tons to learn and tons to know, but the baseline is, me and my friends could do this. Me and you could do this. You and your friends could do this. It is extraordinarily empowering to realize that building a beautiful house is just not very hard. Or expensive, for that matter - this building is made of dirt, sand, straw, gravel, salvaged windows, and found wood. If you've got a good clay soil kicking around near your building site, my guess is you could probably do this for about $500.We didn't wire it for electricity, but it can be done; same with plumbing. Here I am, building a wall. Photo by Hind Baghdadi. at Petra, Jordan. Possibly built as far back as 312 BC. I thought. Photo via Wikimedia. See, what I am attracted to, both in art and architecture, is beautiful spaces. The whole idea of the Museum of Joy is to build a place that inspires, encourages, and celebrates joyfulness. I can't seem to bring myself to make art that people can't in some way inhabit, or step into - which is why I've been drawn to installation arts. The strangest and most revelatory thing about the workshop, in all honesty, was the feeling that without knowing it I've been preparing for cob as a material my whole life. All of my dreams have been of making curved, sculpted, magical, inspirational spaces, since before I knew that cob even existed. And here it turns out that there's this material that is cheap, super environmentally friendly, durable, and incredibly easy to use, and it's absolutely perfect for making unique, sculpted, artistic, meaningful spaces. I mean, cob is a mixture of clay, sand, and straw. You can quite literally sculpt it. You can make a building by hand. Think about that for a second! The possibilities! For me, it's like discovering an entirely new medium. Imagine you're a painter, and someone's just explained to you that if you just take the time to mix your paints from scratch in a straightforward but somewhat labor-intensive way, you'll be able to paint a picture that you can just, y'know, step into. That's how it feels. Here are these dirt-cheap, readily available, nontoxic materials. I put them together on a tarp and I jump on them. And then I can sculpt a safe, beautiful building that will be simultaneously a piece of meaningful architecture and a work of art. Just like that. Without any specialized skills or fancy tools or years of study. Just plain hard work. It seems impossible that it could be so easy, like there's got to be some kind of catch, some complication. I mean, we all know that construction is hard and complicated, or else "primitive" people would have lived in mansions and we wouldn't pay so much for our houses, right? Sort of. 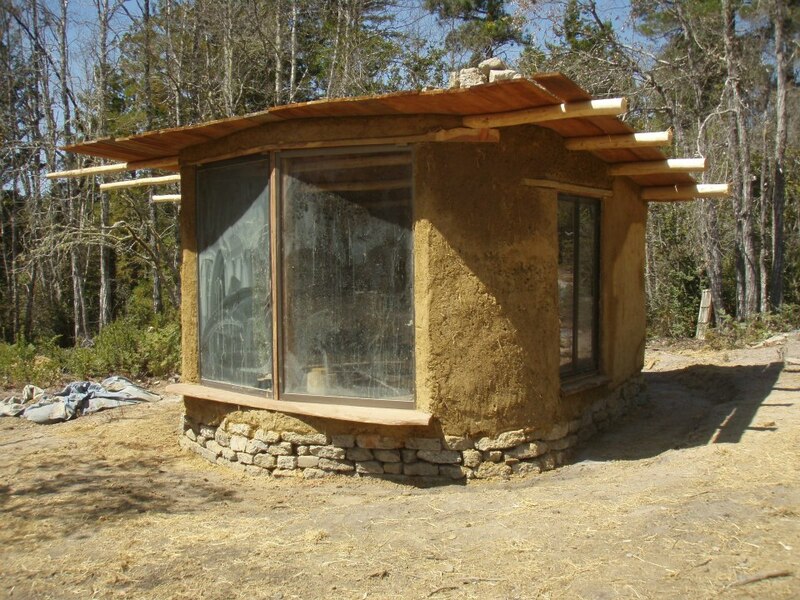 I mean, cob building is not going to save the world, as our teachers kept telling us. 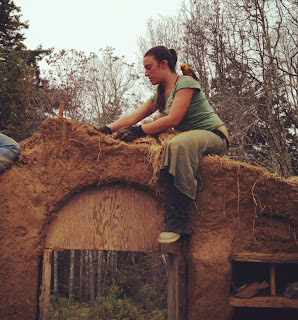 It's not like everyone should rush out and build a cob house. The life-changing moment didn't lie in thinking "Aha, I now have the technology with which to save mankind!" It was much more personal than that. It was, aha, there is a safe, beautiful, easy way to build structures that are powerful and meaningful. I don't need millions of dollars and a second Frank Lloyd Wright to create a place that in its very physical being is conducive to an experience of joy. No, I've got everything I need right here in my own hands and feet. And that really is a revelation. Well, that's pretty awesome. I feel like I should have more to say than that, but that probably, really, sums it all up. Yeah. I kinda had a hard time not making "So, it was awesome, the end" my entire post. Building a house like that sounds amazing. There's always been a part of me that thought I'd have enjoyed living in an age (or place) where things were simpler and more community-oriented. I'm sure you've seen the one-day housing raisings the Amish folk (and others) do--I did a similar (to the Amish) thing with Habitat for Humanity one year and didn't find that easy at all. We all just about croaked from the full day of hard physical labor (but the reward there, too, was in the finished product). And of course that was using things like concrete and heavy tools and pounding nails hard and climbing up and down ladders all day (in other words, the expensive, DIFFICULT way we build houses instead of the cob way). Great post. Thoroughly enjoyed learning something so cool and valuable. It IS amazing. Of course, there's LOTS more to learn - all about weather-proofing, finishing, floors, wiring & plumbing, suitability of cob to your climate, etc etc...but it was one of the most gratifying things I've ever done, and - at risk of sounding totally cliche - super empowering. That sounds like quite an empowering experience. Makes me feel like kind of a wimp in that I don't even know how to change a tire, or fill it when it's low. Geez. Way to go! One of the best things about it was the no-nonsense attitude the (male) teachers had towards negative gender dynamics. Myself and many other ladies I know feel a lot of intimidation around things like power tools and construction sites (although I'm lucky to know plenty of OTHER ladies who can drive a tractor like it ain't no thang) and it was awesome to feel like every single job that needed to be done on the site could be done by any of us equally. Our teachers acknowledged the gender divide, and I'd like to say that they worked really hard to make sure that absolutely everyone felt capable and useful, but honestly? They didn't NEED to. The work was just not intimidating. It makes me think that probably changing a tire is doable too.